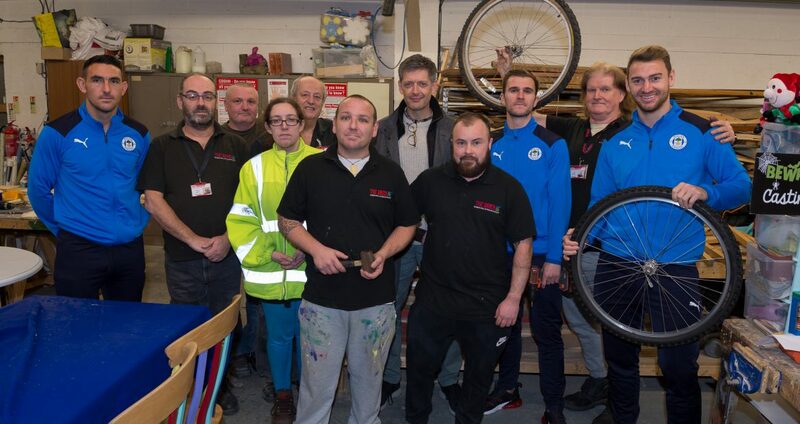 Latics trio make special trip to The Brick Works	"
First team players Callum McManaman, Gary Roberts and Jamie Jones visited the Brick Works on Hodson Street in Wigan town centre before Christmas, to learn more about the Brick and to take part in activities with our service users, which included restoring furniture, woodwork, engraving and fixing bicycles. The Brick were named Latics’ charity of the season for a second successive year in September 2018, with the aim of the partnership, launched by Mayor of Greater Manchester Andy Burnham, to raise an incredible £100,000 to buy The Brick Works facility and secure the charity’s long-term future. Jono Gooding, Service User of The Brick, said: “I’ve been associated with The Brick for the past three years but the past 18 months have been a particular struggle as I’ve had a marriage breakdown, but staff at The Brick have helped to put me back on my feet and if I’m being honest if it wasn’t for them I probably wouldn’t be here today.